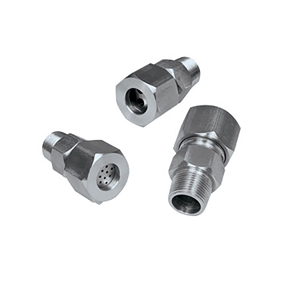 All multiconductor feedthroughs are supplied in standard form with stainless steel ferrules. A stainless steel ferrule deforms and becomes permanent. If it is required that the probes be installed several times at different depths in the feedthrough, PTFE ferrules should be used. PTFE ferrules will not deform the probe sheath, allowing the same probe to be reused. The ferrules used in the feedthroughs are identical to the ferrules used in standard OMEGALOK™ compression fittings. Tape used on all Pipe Joints, Dimensions: (LxW) 1/2x260"
참고: All fittings are supplied with stainless steel ferrules. If PTFE ferrules are required, add suffix "-PTFE" to the model number shown. Add $1 to the cost per PFA ferrule. One ferrule needed for each conductor. PFA tape should be used on all pipe joints to provide a good seal and to prevent the threaded parts from seizing each other on disassembly.